The inaugural Fusion conference was 1 year ago in June 2011 and I was there doing a demo in the keynote, and also presenting a breakout session. If you look at the abstract and title for that session you won't see the term "C++ AMP" in there because the technology wasn't announced and we didn't want to spill the beans ahead of the keynote, where the technology was announced. It was only an announcement, we did not give any bits out, and in fact the first bits came three months later in September 2011 with the Beta following in February 2012. So it really feels great 1 year later, to be back at Fusion presenting two sessions on C++ AMP, demonstrating our progress from that announcement, to the Visual Studio 2012 Release Candidate that came out last week. C++ AMP is an open specification for taking advantage of accelerators like the GPU. In this session we will explore the C++ AMP implementation in Microsoft Visual Studio 2012. After a quick overview of the technology understanding its goals and its differentiation compared with other approaches, we will dive into the programming model and its modern C++ API. This is a code heavy, interactive, two-part session, where every part of the library will be explained. Demos will include showing off the richest parallel and GPU debugging story on the market, in the upcoming Visual Studio release. The last GTC conference in the US was 2 years ago and I was there as an attendee. You may recall from that blog post that we were running UX studies at the time. It really feels great 2 years later, to be back at GTC presenting two sessions on C++ AMP, demonstrating our progress that includes input from those early studies. C++ AMP is an open specification for taking advantage of accelerators like the GPU. In this session we will explore the C++ AMP implementation in Microsoft Visual Studio 11 Beta. After a quick overview of the technology understanding its goals and its differentiation compared with other approaches, we will dive into the programming model and its modern C++ API. This is a code heavy, interactive, two-part session, where every part of the library will be explained. Demos will include showing off the richest parallel and GPU debugging story on the market, in the upcoming Visual Studio release. If you are a developer on the Microsoft platform, you are hopefully attending (live or virtually) the sessions of the BUILD conference, aka //build/ in Anaheim, CA. The conference sold out not long after it opened registration, and it achieved that without sharing *any* session details nor a meaningful agenda up until after the keynote today – impressive! I am speaking at BUILD and hope you'll catch my talk at 9am on Friday (the last day of the conference) at Marriott Elite 2 Ballroom. Session details follow. Developers today inject parallelism into their compute-intensive applications in order to take advantage of multi-core CPU hardware. Beyond CPUs, however, compute accelerators such as general-purpose GPUs can provide orders of magnitude speed-ups for data parallel algorithms. How can you as a C++ developer fully utilize this heterogeneous hardware from your Visual Studio environment? How can you benefit from this tremendous performance boost in your Visual C++ solutions without sacrificing developer productivity? 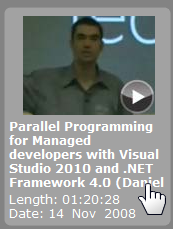 The answers will be presented in this session about C++ Accelerated Massive Parallelism. I'll be covering a lot of the material I've been recently blogging about on my blog that you are reading, which I have also indexed over on our team blog under the title: "C++ AMP in a nutshell". Yesterday we announced C++ Accelerated Massive Parallelism. You can now watch my 45-minute session introducing C++ AMP on channel9. You will also want to download the slides (pdf), because they are not readable in the recording. UPDATE: C++ AMP session recording and slides now available. Next Wednesday at 2pm I will be presenting a session at the AMD Fusion developer summit in Bellevue, Washington State. For more on this conference please visit the official website. If you filter the catalog by 'Speaker Last Name' to "Moth", you'll find my talk. To get full performance out of mainstream hardware, high-performance code needs to harness, not only multi-core CPUs, but also GPUs (whether discrete cards or integrated in the processor) and other compute accelerators to achieve orders-of-magnitude speed-up for data parallel algorithms. How can you as a C++ developer fully utilize all that heterogeneous hardware from your Visual Studio environment? How can your code benefit from this tremendous performance boost without sacrificing your developer productivity or the portability of your solution? The answers will be presented in this session that introduces a new technology from Microsoft. "Microsoft Developer & Platform Evangelism, in collaboration with the Microsoft Parallel Computing Platform product team, is hosting a developer lab at the Platform Adoption Center on April 12-15, 2010. This event is for Microsoft Partners and Customers seeking to incorporate either .NET Framework 4 or Visual C++ 2010 parallelism features into their new or existing applications, and to gain expertise with new Visual Studio 2010 tools including the Parallel Tasks and Parallel Stacks debugger toolwindows, and the Concurrency Visualizer in the profiler. Gain expert design assistance with your Parallel Computing Platform based solution. Develop a solution prototype in collaboration with Microsoft Software Engineers. Attend topical presentations and “chalk-talk” sessions. Your team will be assigned private, secure offices for confidential collaboration activities. The event has limited capacity, thus enrollment is based on an application process. Please download and complete the application form then return it to the event management team per instructions included within the form. Applications will be evaluated based upon the technical solution scenario along with indicated project readiness timelines. Microsoft event management team members may contact you directly for additional clarification and discussion of your project scenario during the nomination process." Saturday – ALT.NET Seattle 2009. Sunday – Jillian's for evening geek party. Monday – Hanging out with Device MVPs: Lunch time + an evening reception, on Redmond campus. Tuesday – evening at the MVP Summit party. Wednesday – probably at WSCTC (keynote, panel and general sessions + lunch). The 1st presentation was this one. The 2nd presentation was a (interactive) Greek version of the code-heavy Parallel Programming session. Finally, for those of you physically living in Greece, there is a 2-page article/interview on parallel computing in February's PC Magazine. Last week I repeated in Barcelona for Tech Ed EMEA 2008 the PDC08 session that I gave in LA. The European recording appears to be also available online on the home page for your viewing pleasure (the direct link is here). PDC2008: Can you afford not to be there? "A Detailed Look at How Multi-Core Architectures will Unleash Computing Power and Enable Innovation"
Register now and see you in the city of angels. The Professional Developers Conference (PDC) is held in October at Los Angeles, which is one of the reasons I am looking forward to be going there (as a teenager I was a huge The Doors fan), another reason being the party. However, the main reason I am excited to be going this year is because I will have the opportunity to share with developers from around the world some of the cool things that our teams have been working on. 1. A whole PreCon day of Concurrent, multi-core programming on Windows and .NET. I have 2 sessions at Tech Ed in Orlando this year. Add them to your schedule. I'll be around all week (Sunday 1st to Sunday 8th), so if you are in the area between those dates and you want to catch up over a pint or 3, ping me. Thank you for attending my 3 sessions in Amsterdam at DevDays 2008. I had a blast! + Resources for my Silverlight session. + Resources for my 5 Things (VS2008 client session). + Resources for my Parallel Extensions session. - Here are the slides (save as pptx). - The demos were a subset of these videos: Samples, Task etc, Parallel class, PLINQ. 5-6 weeks ago I presented at the Greek 2008 Launch (as I mentioned here). The recording is now live online (in a cool Silverlight player). Watch it here. Last week I presented a session on Parallel Extensions in Glasgow (as I mentioned here). Colin posted the speaker scores from the multitrack event and those scores IMO directly reflect the fantastic job the product team has done on this technology – it "sells" itself really. I look forward to delivering a slightly longer version of the talk in a few days at DevDays. The session is 4 demos strung together that are subsets of my 4 screencasts (Samples, Task etc, Parallel class, PLINQ), so watch them and forget the slides. Just came back from a much need holiday (in Madrid) and since I have no new technical content to post, I thought I'd follow my blog's tradition (Jan, Feb, Mar and Apr) and list the events that I am presenting at in May. Funny thing is that after a recent storm of flights, all of the below involve flights as well. Will I ever get sick of this? + 1st, Manchester, MSDN Roadshow 2008. + 10th, Glasgow, DDD Scotland. + 13th, Glasgow, MSDN Roadshow 2008. + 16th, Newcastle, MSDN Roadshow 2008. + 22-23, Amsterdam, DevDays 2008. A week after I fly back from Amsterdam, I fly to Orlando for Tech Ed US (more on that nearer the time). Last year I presented for the first time in the Netherlands at DevDays. This year the organisers invited me back to present 3 talks (different to the 3 from last year) on 22 and 23 May. Register from here. For the abstracts of the sessions above or to view the full conference schedule, click here for the Thursday and here for the Friday. Hope to see you there! Tech Ed Israel – Best conference party ever? I am back from my travels, and if you attended my 2 talks at Tech Ed Israel 2008 you'll find resources for them here and here. There is a great agenda of sessions for the Scottish Developer Day (DDS) in May and I hope you'll choose to come to my session on Parallel Extensions. Register here. Tech Ed in Orlando is in June and I have a couple of sessions there (more on that nearer to the time). I like how they used Silverlight 2 to list the speakers (although the z-ordering is not as accurate as I was expecting it). Give it a go, have a play. Following the dozen (predominantly UK MSDN and user group) events that I did in Jan and Feb, the future is consumed by larger (inter)national events. 12th London , QCon 2008. 19th Birmingham, UK 2008 Launch. 31st, Athens, Greek 2008 Launch. 7-8, Eilat, Tech Ed Israel 2008. 21, Cardiff, MSDN Roadshow 2008. Cardiff, or London, or Manchester, or Glasgow, or Newcastle. Is it possible that two great, week-long, independent, international developer conferences are running at the same time in London? It turns out that the answer is "YES" and someone thought it would be a good idea if I presented at both. If you are going to DevWeek or QCon London, make sure you come to my sessions to win some t-shirts! After my two week relaxing Xmas/NewYear break, the numerous January events were a bit of a "shock to the system" dominating my time. Now onto February and it is not looking any easier as you can see below. + 5th, TVP, Details and registration. + 18th, Bristol, Details and registration (how jetlagged am I going to be for this?!). + 21st, Manchester, Details and registration. + 26th, TVP, Details and registration. + 27th, TVP, Members of the UK press talk to your MS contact. Little over a month ago I posted: How To Start a User Group. In addition to the list I linked to there, Dave posted his own thoughts and also Chris followed with his tips and tricks. Both are definitely worth a read. Any additional thoughts welcome (it is getting much tougher to complement those 3 though!). In a somewhat related story, Nick complains how it is unacceptable for speakers to cancel presentations at user groups, especially at the last minute. I agree, unless there is a health issue, it is very uncool. Touch wood, I've never ever had to do that. In other news, if you are in the UK, we now list all User Group events on the same MSDN page where we list Microsoft events – James explains how. + 14th, Oxford, Details and registration. +16th, London, Details and registration (PDF). +17th, Manchester, Details and registration. +23rd, Edinburgh, Details and registration. +24th, Edinburgh, Details and registration. +29th, London, Microsoft Partners talk to your MS contact. +31st, Leeds/Bradford, Details and registration. Via Christopher, I found the post by Blogus Maximus on his 21 thoughts for running user groups. If you are in the UK and are thinking of starting a user group read that useful list. When you are ready, follow his advice on #3 and shoot me an email! Thank you to everyone that came to my September, October and November events. In total from 18 September to 29 November I delivered 21 sessions. December is always the quiet month from an in-person events perspective and especially for me since I'll be taking 1/3 of it off for holiday. That also means that (with January round the corner) I better spend time figuring out what the heck I am going to say/show for my upcoming Windows Server 2008 developer sessions (all ideas welcome!). We have just started a new scheme of online chats that you are welcome to join IF you attended one of our MSDN events in the UK this year. 14th, Online, Calendar appointment with chat room URL. 17th, Online, Calendar appointment with chat room URL. FYI, for UK events (inc. ones that have nothing to do with me) monitor this developerfusion feed. In the US they run these things called Code Camps which essentially are a 1-day community conference. If it rings a bell with my UK friends, it should: That is where we borrowed the whole idea of DDD. Spot the similarities in this very useful checklist for Code Camps. After the huge MIX event held in Las Vegas in May, dozens of great RE-MIX events followed around the world. In almost all of them, the content from the main MIX event was taken and delivered via mostly some local speakers presenting the existing material. You didn't need me to tell you that, the title of those events gives it away: RE-MIX. Today we opened registration. Spaces truly are limited (I think we missed a trick there by not finding a larger venue) so, for opportunities such as seeing Scott Guthrie delivering a few sessions, REGISTER NOW. Also, the NxtGenUG boys would like you to fill in a free quick survey for the 'Swaggily fortunes' game taking place at Mix:UK – attending is not a prerequisite for completing the survey. You may even win a prize just by answering a few questions and remember that the answer to question 6 is Daniel Moth, go fill it in. In June 13-14 a popular international developer event in Amsterdam takes place: DevDays. Windows Vista brings with it a fantastic platform for managed development, namely .NET Framework v3 (i.e. WPF, WCF, WF and CardSpace). However, there are many new native APIs (obviously not part of the .NET Framework) in Windows Vista. In this 2-part talk you will discover how you (a C# or Visual Basic developer using Visual Studio 2005 or Visual Studio codename "Orcas") can take advantage of this new functionality. This demo-driven session, will teach you how to make your application feel like a real extension to the Windows Vista platform (and not like a ported application that just runs on it). Vista-only features covered include extending glass into your own applications, the new TaskDialog and CommonOpenDialog, Windows Error Reporting enhancements, Restart API, Recovery APIs, Restart Manager, building power-aware apps, writing preview handlers, conforming to User Account Control (UAC), using search from your application, Sidebar gadgets, SideShow plus more. Successful mobile applications are designed for mobile users. We will take a comprehensive look at the managed APIs of the Windows Mobile platform for richly interacting with core device features such as Outlook Mobile and learn how to create smart applications with the State and Notification broker. Come see how developer tasks previously requiring lengthy C++ are now achieved with two lines of managed code! Through Visual Studio 2005 (or Visual Studio codename "Orcas"), we will demonstrate using the camera to capture pictures and video, the interception and processing of SMS messages, placing phone calls, dealing with system level events, programmatically sending e-mail and SMS messages, and provisioning devices with XML to name but a few! These APIs are not part of the .NET Compact Framework. They apply equally to Windows Mobile 5.0 and Windows Mobile 6. I will highlight what is new in WM6 in this area as appropriate. If you live in Europe and you missed MEDC in Vegas last week, then you have only one week left to register for a great price for the European version, held in Berlin on 25-26 June. 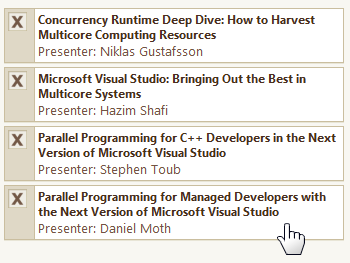 I will be repeating my two sessions (share code and GUI tips) and also participating in a panel session. ...and don't forget another joint session (23 May) we are doing specifically on LINQ that you can register for at the Fest07 homepage (the day also includes sessions from Rafal Lukawiecki). Finally, how could I ommit yet another repeat of the popular MSDN Roadshow, delivered by the entire team this time in London (11 June) – register for free here. Do you have pressing questions about the .NET Compact Framework? Do you use OpenNETCF's Smart Device Framework and have specific questions? Do you have general questions on Windows Mobile and Windows Embedded CE development? Come to this session where members of the Compact Framework Team, OpenNETCF's Smart Device Framework team and other industry developers will be part of a panel answering questions from general coding to architecting mobile software, even covering .NET Micro Framework. Whether you were first introduced to .NET via the Compact Framework in Windows Mobile or via the full .NET Framework on the PC, it may make sense to share your code assets between the two platforms. In this session we will explore when you should be doing this and when not. We will then explore the options available (e.g. directly sharing binaries or conditional compilation) and drill into problems and workarounds. This will include framework differences, platform/OS differences, optimal usage of Visual Studio 2005 (and "Orcas") and how things have improved since NETCF v1 and v2 (going towards v3.5). When managed code first came to devices, there was a lot of excitement because developers finally had the ability to make use of their existing skills and assets from the desktop world, into the Windows Mobile world. The truth is that building GUI applications for Windows Mobile, is not the same as building GUI applications for your PC or laptop. In this demo-driven session, we explore the platform differences between desktop and mobile, and also explain what you must do to address them. In addition to explaining best practises for building mobile applications for mobile users, we look at the UI guidelines for Windows Mobile and map those to the code required for meeting them. You will also gain an understanding of what is required in order to write cross-device code including what Windows Forms controls are best avoided and how to overcome potential .NET Compact Framework limitations. 1. 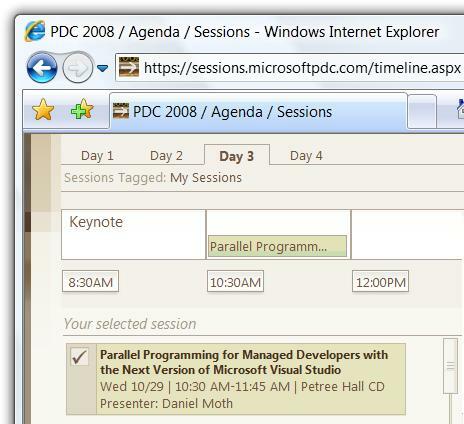 MEDC 2007 is the first major event since the launch of Windows Embedded 6.0 and .NET MicroFramework. Just imagine the content that will be available there on those two products and don't forget XP Embedded! 4. MEDC 2007 is the first time we will get an in-depth look at .NET Compact Framework 3.5 and at Visual Studio for Devices in "Orcas". 5. MEDC 2007 is in the coolest city on the planet: Las Vegas! And if you are not into all the glitch and partying, there is one awesome reason to visit the area. Take an extra day (e.g. Sunday or Friday) and visit the Grand Canyon next door - it is simply breath taking (or Hoover Dam just a short drive away). No excuses dudes (and dudettes), just go register first and seek permission later! I love it when I can answer two questions with a single answer (it's all about reuse :-)). Delegates at our MSDN events sometimes ask about how to find local groups where they can attend technical events, not necessarily organised by Microsoft. Also speakers from other countries often ask me about speaking opportunities when they visit the UK. To both I say, visit the UK User Groups list here. Follow the links to see what type of events each user group usually holds, locations they cover (usually more than one) and get in touch with the UG leader - simple. If you currently run a user group in the UK and you are not listed on the page above, take action now. If you are listed on the page above and are looking for a Microsoft speaker to come to your event, take action now. In both cases the same action should be taken: email our lovely leader of community leaders, Clare Parr (clarepa at microsoft dot com). An example of a user group not listed up there yet, is a spanking brand new one holding its first meeting next month: .NET Developer Network. Do you read abstracts of sessions? Planning for Tech Ed 2007 has started. As one of the largest dev conferences, in each timeslot there is a lot of choice and attendees sometimes make the wrong choice (and then score the session badly of course because it wasn't what they wanted). This is a genuine problem with technical events and is not specific to Tech Ed. Dave is looking for ideas on how to improve the session descriptions and has some radical propositions for changes. Go give him your feedback. In my opinion, no amount of shortcuts is going to tell me what the session is going to be like other than the abstract. I really don't understand why people don't read the abstracts carefully before going into a session. If everybody read the 7 line paragraph and made their decision based on that, then we could work on speakers writing accurate abstracts. As an example consider my session description here. After the session, one of the delegates came up to me and said, "I enjoyed your session but was a little disappointed as I was expecting you to cover what was coming in Orcas for Vista development". At first I was baffled why he would think that, but then I guessed what happened: the guy read the title and nothing else. Again, please read my abstract and see if it was not clear what the session was about. There is an argument here for better titles, but how can you capture a 75' session in 7 words? If you are one of the delegates that do not read abstracts and just turns up at sessions based on the title alone, let us know why and maybe tell us what is it we can do to incentivise you to read those abstracts. Today (20 Feb) I am travelling up to Nottingham to do a talk tomorrow (21 Feb) on LINQ. On Thursday (22 Feb) I travel to Wales to do an academic tech talk on Windows Mobile development the following day (23 Feb). Next week (26 Feb – 1 Mar) I am attending DevWeek in London and presenting there on Vista development (28 Feb). Next Friday (2 Mar) I travel to Glasgow for an event on Monday (5 Mar) again on LINQ. The following day (6 Mar) I travel to Wales for a 2-day internal offsite where I am doing a small piece on Vista. When I return, I travel to Heathrow (8 Mar) for a two day DevFest event where I am delivering both Vista and .NET Compact Framework presentations. The week after, I travel to Harrogate (12 Mar) to do yet another session on LINQ (13 Mar). The following day (14 Mar), I am doing another Windows Mobile tech talk at Manchester Metropolitan University. BTW, all three LINQ sessions above are part of the MSDN roadshow (additionally on 21 Mar in London and 27 Mar & 25 Apr in Reading). Phew! In short, for the next 22 days I am constantly travelling, talking/demoing or prepping (contrary to some beliefs, these sessions don't just deliver themselves with no prepartion on slides/demo/timings!). In any case, don’t expect anything new from this grok talk, it will be a cut-down version of either the Sidebar screencast or the SideShow screencast. See you there! The roadtrip ended and overall it was a very positive experience and I would do it all over again given the opportunity (maybe with a slightly more upmarket accommodation than the Travelodges)! Mark has been capturing the trip’s journal on the official blog so check out the photos of Day 1, Day 2 morning and afternoon, Day 2 evening, Day 3, Day 4, Day 4 and 5. The venue that stuck out compared to the rest in terms of its bizarreness was the event in Coventry. The crazy NxtGenUG people decided to host the event in an old airplane! From a temperature perspective it was practically like presenting outdoors in minus degrees Celsius. I have never done a presentation in my woolly hat and gloves before but I guess there is always the first time! Laugh at the photos on the NxtGenUG site. Today I am doing a couple of sessions for the UK launch of Office and Vista at TVP, tonight I’ll be at the launch geek dinner and tomorrow I’ll be helping out at the hands-on labs at Day 2 of the launch. BTW, you can all participate online as well where recorded versions of our sessions are already waiting! Next week, Mon-Fri, we are going on the road to follow up on the promise I made a while back. We are doing countless events stretching from Southampton to Newcastle in a car. It is only 4 out of 5 from the team on the roadtrip, as the fifth member has bigger issues that he needs your help with! To follow the trip in a virtual way stay tuned on that feed... More from me back here in a week! Remember the Office and Vista launch I mentioned? Preparing for that has my undivided focus for the next 11 days. While physical attendance is now sold out, anyone can still participate online; UK residents that do participate online have a chance of winning free copies of Vista and Office! More details on Ian’s blog. We want to speak at your company! We are the Microsoft developer and platform team in the UK. You are a company in the UK with a room that can hold 35+ people; your developer people! You provide the room and people, we provide the entertainment. Well, I say entertainment, but what I mean is free presentations on developer aspects of Vista and Office. We’ll also throw some prizes on the day :-) Also, if you don’t mind, we’ll publicise your involvement and contribution! For UK residents I only have two words: REGISTER NOW! MGX is Microsoft's global sales conference and TechReady is the internal technical conference (think TechEd for MSFT personnel only). I am thrilled to be attending TechReady3 in Seattle and also looking forward to catching up with people in Redmond that I know from my MVP days and others that I have only met virtually since joining here. I cannot put my hand on heart and say that I am "super-excited" to be going to MGX (and probably won't ever go again) but everybody has to do it once… apparently. Having said that, MGX is in Orlando and I haven't been there before so that's cool. If I am lucky I will do some SCUBA diving and maybe go say hello to mickey mouse (no I am not talking about any current or ex-colleagues :-p). Not sure if I'll blog or check email that often from the States so wish me a nice holiday business trip. Those of you in the north of UK and in particular the Newcastle vicinity are invited to my session at VBUG. If you are a .NET dev with ZERO previous knowledge on .NET Compact Framework or mobility, go register now! MSDN Roadshow: 3 down, 3 to go. In addition to presenting at events, I also attend many in a support/helper capacity. As such, I mingle with the crowd and get to hear what they think about our products. Recent such events were the DevDays event on security in London and the DDD III event in Reading (also look out for me at the Office DevCon in a couple of weeks). 1. Search MSDN. Write your question down as if you were going to email it to someone. Then pick out the words that your mom wouldn't understand and enter them in the search box. You'll be amazed at how useful the results can be. Sometimes we forget that we don't call it the Microsoft Developer Network for nothing. 2. Search the newgroups. If you don't find an answer, post your question to the newsgroups. My bet is that there are no .NET developer questions on our current technologies that the above route cannot answer... none! Remember that ultimately, Product Support Services is the place where you can get help in an official capacity. Finally, your feedback is always appreciated on ladybug. Last Tuesday, attendees of the MSDN Roadshow in Edinburgh, got to see me demo some Vista developer features and were probably the *first* large public audience worldwide to see Vista Beta 2 in action! Those of you in the UK attending the other roadshow events (Manchester, London, Bristol and Reading) will also get to see the same session on "Windows Vista: a developer's glimpse". Registered attendees receive a link to the slides and demos via email. If you were at the Birmingham show, note that the slides/demos have changed since then (but will remain the same going forward) so please revisit the post-event site if you wish to get additional material. I promised I'd put on my blog some Vista URLs so enjoy these Vista developer resources! I attended a whole bunch of sessions but the most interesting ones where the private MVP events (with VSD/NETCF/SQL Everywhere/WinCE teams); this was my last chance to (pretend to) be an MVP since I had arranged my attendance/speaking at the conference wey way before joining Microsoft UK. Hanging out in the MVP Cabana and Speaker Cabana was an excellent way to network with other influencers on our most excellent platform(s). Oh, my talk was very well received which is always nice... If you are attending Tech Ed in Boston or Tech Ed India, you will have a chance to see my 30 slides and (40 minutes worth of) demos... It won't be delivered by me (due to logistics), and I take it as a compliment that the session I created has been chosen for replay at the largest Microsoft conference :-) If you were at MEDC and didn't get a chance to get the slides, ping me and I'll make them available to you. The Mobile & Embedded Developers Conference (MEDC) takes place in Las Vegas next week, full details here. This is basically the TechEd of the mobile/embedded world. No company remotely serious about mobility can afford to be absent so I hope your employer is sending you (or one of your colleagues ;-). Whether you were first introduced to .NET via the Compact Framework / Windows Mobile _or_ via the full .NET Framework on the PC, it may make sense to share your code assets between the two platforms. In this session we will explore when you should be doing this and when not. We will then explore the options available (e.g. directly sharing binaries or conditional compilation) and drill into problems and workarounds. This will include framework differences, platform/OS differences, optimal usage of Visual Studio 2005 and how things have improved since NETCF v1. If you are in London (or anywhere in the vicinity) come join me at this free developer event. It takes place in Soho at Microsoft’s premises (swimming pool room). Download a map with directions here (pdf). It occurred to me that, besides being busy with commuting and my current project, I have also participated in a number of events recently without reflecting on them, so here goes. TIP: Read them bottom up, since that is the order I wrote them in. I’ve described the venue further below so will not do it here again. This was the first time I managed to attend the Dot Net User Group meeting and I will be back for more. The topic was patterns and architecture by Matt Deacon of Microsoft. Most interesting were the follow up conversations down the pub including debates on the differences between consultants, permies, contractors and “body shops”. - VS Launch event in London. 1. Sure you served me lunch but at the breaks all you can offer is water and smoothies? What happened to chocolates, cakes, biscuits, beer etc? 2. Where are the freebies? Just flyers doesn't cut it, give me some toys. 3. On a more serious note, (I am sorry, but) the sessions were poor not only on delivery (OK, only half of the ones I went to were very poor) but the actual choice of content was inexplicable. I was reading the session titles and couldn't get motivated to go to any of them. 4. Where was Avanade's presence? We are platinum sponsors in the US, silver sponsors in the UK, and one of the reasons I decided to attend in the end was to help at our stand - nobody told me there wasn't one! Every so often, the UK MVPs are invited to a "pie & pint" evening at a pub (a number of these vents run across the country). Our lovely FGM pays for our food and for our drinks in exchange for us making complete fools of ourselves - fair deal if you ask me :-) I had never gone to one of these before as the nearest to my home is the London one and I never worked in London before; now that I do, I get to attend evening events like this and I certainly will again. This was the first time I went to the etc conference in the Hatton and it is not a bad venue that serves great food. It was also the first time I went on training that was *completely* non-technical, with a mixture of Avanade employees from *all* disciplines. It is a public course that promises to change the way you view your life (and then it is up to you to act on that). It was delivered by these guys. Sorry Nick, I haven't started my master list yet but it is on my... TODO list. The location for this event dominated my thoughts. Our own Avanade offices are on Wardour Street in Soho and I get people cracking jokes about that, but have you seen where MSFT offices are? You have to avoid offers for s3x, regardless of the direction you approach it from! Into the building and it turns out when they said "it is in the swimming pool room" they weren't joking. The room is basically a swimming pool with no water in it and with some modifications to make it usable as a presentation room. David Goon had his delivery well practised and I am definitely stealing the idea of "nuggets" for a future talk; it sounds much better than "tips and tricks". There was a break between the 1-hour stints and we enjoyed pizza and beer - definitely going back to the next MSDN event there. I had a blast. I only got a chance to attend 3 sessions and the top one in my book was Ian G's Avalon session. Ian if you want my feedback, replace some of the "why" time with demos - but other than that, it was top class. My two sessions were very well received, with both rooms "selling out". My apologies to the people that were turned away, but even standing room was taken! Full credit goes to the C# team for the debugging enhancements in VS2005 and especially to the Class Designer team: those topics sell themselves and all I had to do was deliver the facts. When you join Avanade, you get your induction in the Seattle office, along with a bunch of people from other Avanade offices around the world. The induction consists of fun, basic consultancy skills training, fun, team activities, fun, education on Avanade processes/tools, and, of course, a lot of fun. My only complaint is that I cannot do it all over again. It is worth you joining Avanade simply to go on this course! Shouldn't really include this since I did not attend, even though I had registered. Found out the content was not geared towards my interests, plus I had already submitted my book proposal (MSPress, how long do you need to reply - a simple yes or no will do). This was a single session that lasted 3 hours, thus giving us an excellent introductory overview to Indigo. The two speakers were Richard Turner and Ari Bixhorn (saw Ari first time in Barcelona teched 2002, and every time he proves that he can host a good show). Plenty of demos and audience interaction meant that I stayed awake, even though I had performed a marathon trek earlier in the day to find Bruce Lee's grave in Lakeview cemetery. If you are in Ireland, don't forget to come join us in Dublin this Friday for a unique wine & cheese tasting experience that follows my talk on Whidbey for devices (with an intermediate stop at the bar for some beer :-). It would be nice if you register, but previous experience indicates you can just turn up! See you there at 18:30. Yet another .NET Compact Framework MVP chat took place earlier today. Once again we left no question unanswered whilst a couple of times we had to refer folks to post in the newsgroup. I'll be there! Come say hello at the Microsoft booth or at the "Ask The Experts" session. This evening was the time for yet another local VBUG meeting. This time the subject was SharePoint (you know, web parts and all that). I have not touched ASP.NET since 2001 (and even then it was only for a month writing proof of concept projects) and before tonight I couldn’t spell SharePoint, so I went with a total newbie mindset. Jonathan with his "code monkey" (Nick Francis) gave a good show and now I feel I can talk about the subject a bit. What was more interesting with today’s session is that at times it drifted into a chat and quite a few “asides”. Not sure what the others made of that, but I think that is what local user groups are all about: free-form exchange of ideas. At the end I had a chat with Ian (organiser) and arranged to hold a session for VBUG either in Brighton (March) or Horsham (April). Full details will be on this blog nearer to the time, but you can guess what the subject will be, right? It was yesterday 18:00 GMT; you missed it! Why? I have told you about these before! Every so often I come across a blog post where the owner asks a question to their readers. Most of the time they would get a faster response if they posted to the relevant newsgroup. I realise that some people don't like using newsgroups, but a chat is more direct. There is no chance of you posting something and being ignored, you are exposed to less people, and your name is not captured in any archives (I am just randomly eliminating possible reasons that people don't post at newsgroups). Every .NET area has its own chats, so there are loads to choose from. So follow my links above and take note. I hope to see you there next time. Oh, I almost forgot, apologies to the two people whose private messages I ignored, but as you could tell I was busy answering questions. I apologise assuming they are readers of this blog (otherwise, s*d them, I don't like unsolicited messages (of the "HY" variety)... only joking folks, *do* feedback to me whatever is on your mind... just save the generic questions for the newsgroup and the chats :-). Just came back from the local VBUG meeting session, where Benjamin Mitchell presented an introduction to .NET threading. It went down well but, every time I see someone presenting threading topics (and I have seen a few), I always think this stuff is hard to explain to others (it's hard enough knowing how to use it, but teaching it takes the biscuit). The second thought that crossed my mind (besides that I should finally volunteer to run a session or two at VBUG), was how lucky the desktop guys are with all those resources in the Threading namespace (I cannot use them in my full Fx projects, as virtually all my desktop code runs on the CF as well). He mentioned in passing how Whidbey makes life easier and that got me thinking: I have blogged about threading topics before but how much easier would it be to explain the usage of BackgroundWorker? I guess that has to be the subject next time. 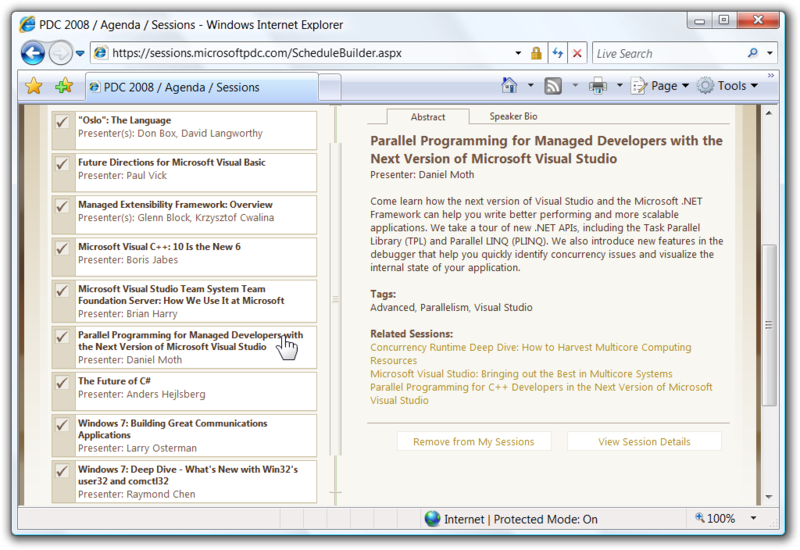 My introduction to .NET was at the annual VBUG conference in 2000. I have never been back to one (mainly cause I go to TechEds instead) but this year Peter Westwood was there. He has a nice write-up of the final day on his blog so go read it! Today I presented a feedback session from July's Tech Ed in Amsterdam. At Tech Ed, I mainly followed the Whidbey sessions. My employer sends me to these events on the basis that, upon return, the knowledge is shared with the rest of the group and it does in fact form part of my review. What is great about these debriefings is that in order to prepare the material (slides, demos etc), I get to revisit not just the sessions that I attended at the conference, but also research everything relevant to VS2005 and .NET 2.0. My audience consisted of C++, VB6, C# and VB.NET devs plus managerial types. In case you are in a similar situation (feeding back or just presenting on the same topic), here is the outline I followed. PART A. 25 introductory slides summarising the various MSFT product roadmaps. This consisted of material straight out of the Tech Ed keynote. As you can imagine, I lost all managerial persons after this. PART B. 100 slides (plus tons of demos). More on this further below. So the main part is the second one (PART B) and the list of its contents follow. I give you some URLs where there is useful info for coalescing into slides and demos. My material came mostly from the Tech Ed DVD and I don't think it is available online anywhere. Points of most excitement: Generics, refactoring and debugging! As usual, I showed the TechEd intro clip. Basically a 2-3 minute MTV-style video including scenes from the party and generally showing what "hard work" attendees have at these events :-) If you ask me, I think MS should make these clips widelly available as they form good advertising for the conference. By the way, special thanks to Tim for sorting out some issues I had with the conference DVDs. 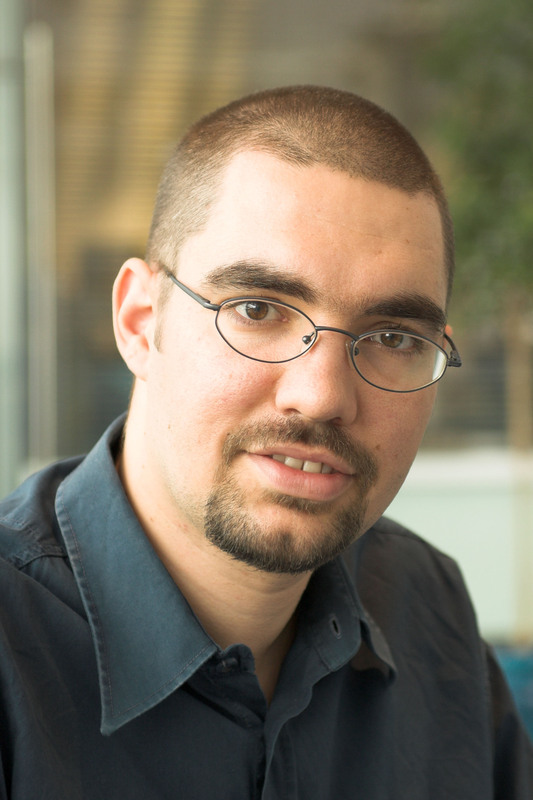 It is individuals like him that help MSFT's image of a company that cares about the customer. You know that many have not made the move to managed code yet. Inevitably, the question of which language is best (which should we choose etc) comes up. This has been done to death, but the subject never ceases to come up. I think, against my better judgement, I will blog about C# and VB soon. 1. New VB6 "Standard EXE"
That's it! You've just used a .NET Stack class in VB6 by hosting the runtime.